Now back from Kouvola and St. Petersburg, I would like to share with you, how deeply impressed I am with historical transport and mobility studies in Eastern Europe. There is so much research in Eastern Europe ongoing, which still is not enough recognized in the Western world. This year it was a young conference, with more PhD-students than ever. Again, the conference underlined the vitality of the field of transport and mobility studies and its precarious institutional setting at the same time. We do not have enough tenured positions in the field in order to secure stability and continuity of attendance and membership. The lively creativity has to be counterbalanced by more institutional endurance. The experience of the Schengen-Border between Finland and Russia by train and the difference of life styles and academic attitudes of the two hosting institutions and countries served as ideal framework condition for partly breathtaking and path breaking insights into the permeability of borders. The quite different border experiences of the speakers from 25 countries showed up in most talks and discussions. A very good example for learning by diachronical and international comparisons was the last plenary session on Saturday 28 September in the Assembly Hall of the State Transport University. 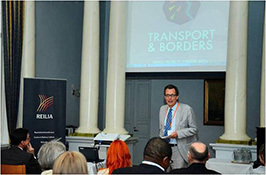 Sipho Khumalo, Chief Executive Officer of the Cross Border Road Transport Agency of South Africa presented lessons from history for his approach to facilitate border crossings in Southern Africa. At the border between South Africa and Zimbabwe, trucks have to wait for up to eight days to pass the different border controls. It is not easy to facilitate cooperation between the two countries and the different agencies involved. Because of the interesting talk of Alexey Sergeev, Chief Secretary of the board of the Interparliamentary Assembly of the Commonwealth of Independent States (the umbrella organization of the succession states of the Soviet Union, on the day before, Sipho Khumalo and his commentator (transport consultant Nuno Ribeiro from VTM, Lisbon/Portugal) suggested to compare the situation in Southern Africa rather with the attempts to facilitate border crossings in the Commonwealth of Independent States than with the more and maybe too advanced European Schengen model. What a new perspective! There were many more examples for the benefits of the “genius loci” of the conference for discussing the complexities of mobility across borders. You will find the full papers on our website (if you are a member). Please have a look. In any case you find the abstracts. From an organizational point of view, this conference was more challenging than ever for the local organizing committee. I am so thankful to Jenni Korjus, Igor Kiselev, Heli Mäki, Polina Polukhina, Anu Kilpinen and their team. You did a wonderful job!